A Thin, Bendable Dusting Wand For Fast and Easy Cleaning. This long, flexible wand offers one of the easiest ways to dust your home, office or vehicle. It is a microfiber duster, and it is easily one of the best tools for cleaning and dusting in hard-to-reach places. 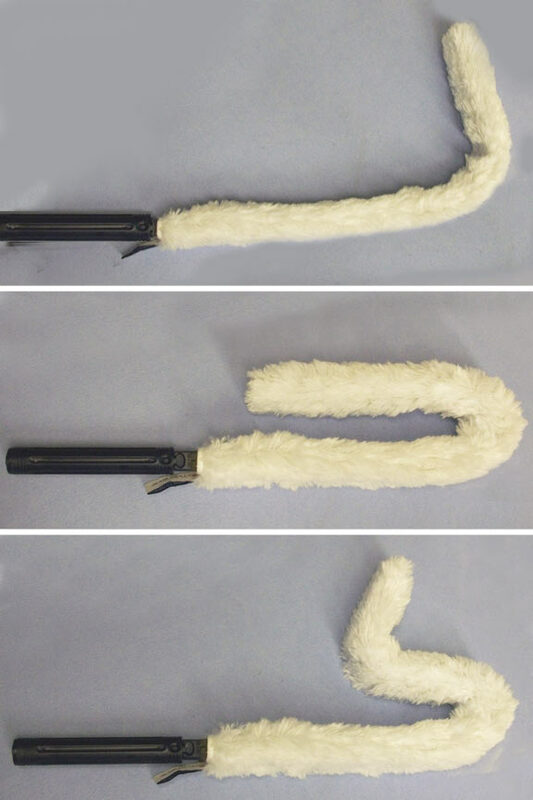 Some call it a big bend duster or a dusterator, but whatever you refer to it as, this wand is unmatched for it's ability to pick up dirt and dust in tight spaces. It will no longer be hard to reach under the bed, on top shelves, all the way around ceiling fan blades, behind book cases or on top of paintings and mirrors. Plus you will be able to get under and between things too. Clean under the refrigerator and stove, in tight crevices and more in a flash. Dirt, dust, hair and micro particles will lift off the surface and become locked in the microfiber material. No chemicals or extra sprays are necessary because the unique microfiber material does all the cleaning for you. Remove 99% of all dirt and germs with just this duster alone. Our dusting wand comes complete with a dusting sleeve that is totally washable and reusable. Use it dry to dust surfaces all over your home or office. The long microfiber material will reach out to cover more surface area, and as you clean, it will build a static charge that will attract dust like a magnet. The duster’s unique bendable ability allows you to reach into the most difficult places places like under furniture, between appliances, behind the fridge, under tables, plants on ledges, your baseboards, the top of ceiling fans, inside vents, and even in tight corners of vaulted ceilings. You can bend the duster to any shape you need for cleaning a variety of items, and the material is safe to use on any surface. The inner core is even padded to further protect any item you are cleaning. The long and slender design is both highly useful and easy to manage. It will be lightweight and versatile so even full house dusting can be accomplished without strain, but you will still have a large amount of surface area to make it a quick and easy task. Attach it to the handle of your microfiber mop and reach the highest areas of your home, or purchase our dusting wand kit, and the extension handle is included. Super-absorbent, highly durable microfibers are 100 times smaller than conventional fibers to cut through grime, but they won't ever streak, scratch or leave lint behind. Microfiber is excellent for dusting because the fibers are statically charged. This means less work for you because the static electricity attracts dirt, pet hairs, dust balls, and micro particles like a magnet so you don't have to chase them down. This static charge also helps keep all of these particles on the ground and eliminates the fly away effect, so it is great for anyone with allergies or respiratory problems. If you have hardwood floors, you will love it. The reusable sleeves are washable hundreds of times. Order Yours Today! 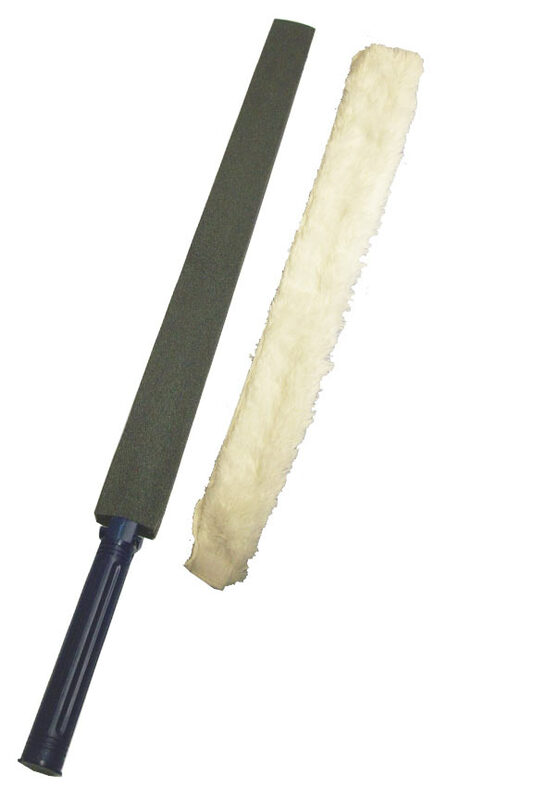 Duster Dimensions (l x w) 30" x 3.5"
Sleeve Dimensions (l x w) 25.5" x 3.5"
Microfiber Dusting Wand - Reach almost anywhere. Clean the most hard-to-reach places with little effort. A fast and easy cleaning solution. I manage a house rental and I need items that help me reduce the cleaning time. At first I was underwhelmed with the duster. It bends and flexes as described, but I thought it was wobbly. However, the microfiber cloth does a great job of removing thick dust from ceiling fans and I'm experimenting with using it behind beds and the washing machine to remove dust bunnies, etc. I found I needed to reduce my grip, tighten the "wrap," and use the wobbliness as a feature, so it's growing on me and I'm using it more and more. I had high hopes of this product and thought it would be great for ceilings, corners, blinds, and ceiling fans. However, I found it to be very flimsy. You can bend it to make the top a 90 degree angle but the problem is that the rest of it is too flimsy, therefore not cleaning well. On the other hand, they make great swords for kids to use without getting hurt! 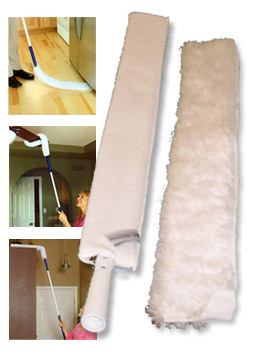 The flexible microfiber duster is a handy helper with the 4 ceiling fans and high ledges that are in my house. Worked well for very high space. This dusting wand is fabulous. I have been using it for 2 years and it still is like brand new. The cleaning cloth has held up to many, many machine washings. I am ordering another for my summer home and 1 for each of my daughters. Do you have a micro-fiber product that isn't flexible? The flex portion might wear out where it doesn't stay in place. Thank you. We don't. The inner core of this duster is commercial quality and designed to be bent and re-bent many times over. You should not worry about it losing ability. Is this cleaning wand(flexible microfiber duster)thin enough to get under washers and dryers and other appliances? Yes it is. It's perfect for the jobs mentioned. Are there disposable heads to this product? Not that we sell, but other products that fit would certainly work. One of the key benefits for this duster is the ability to wash and reuse the covers in order to save time and money. What is the sleeve for? Just a cover or does it also clean? The sleeve is made from a special material, and it's essential to the cleaning process. Once it gets dirty, you can also take it off to launder. A Vitamin Based, Alcohol Free Hand Sanitizer Spray. A Large Tub Of Powerful, Pink Cleaning Paste. Two Piece Set With Telescoping Pole. Clean Any Window. No Matter How High. Replacement Microfiber Mop Pad. Use Dry For Dust Mopping. Groom, Clean, Bathe, Scrub, Massage Or Dry. A Powerful Tool For Pet Lovers. A High Quality Replacement Pad For Your Microfiber Mop.